James Walker Fannin, Jr (1804-1836) – Fannin was a 19th-century U.S. military figure in the Texas Army and leader during the Texas Revolution of 1835–36. Born January 1, 1804, Fannin was the illegitimate son of a Georgia plantation owner, Dr. Isham Fannin. He was adopted by his maternal grandfather, James W. Walker, and reared on a plantation near Marion, Georgia. 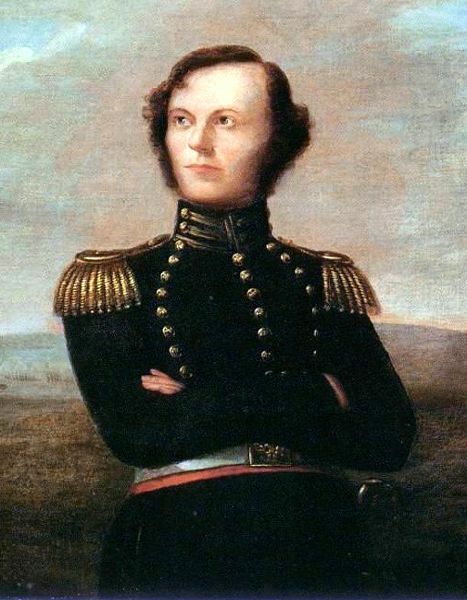 In 1819 he entered the U.S. Military Academy at West Point in New York. He resigned in November 1821 and returned to Georgia where he became a merchant and married Minerva Fort, with whom he had two daughters. In 1834 Fannin and his family moved to Velasco, Texas, where he became a planter and managing partner in a slave-trading syndicate. When the Texas Revolution erupted in 1835, Fannin joined the Texas volunteer army. Because of his West Point experience, he was given the rank of captain and later colonel. With Jim Bowie, Fannin fought at the Battle of Concepción and participated in the siege of San Antonio. In March, 1836, Fannin and his men were stationed at the Presidio La Bahia (which he called Fort Defiance) in Goliad, Texas when they were ordered by Texas General Sam Houston to retreat from Goliad to Victoria. On March 18, 1836, Fannin led more than 300 soldiers along with nine cannon and all their supplies and baggage out of Goliad. After they had traveled about nine miles Fannin ordered the column to halt to rest the animals. At about 3:00 p.m., the Mexican cavalry appeared and the Texians immediately formed a defensive square with their wagons, and placed their cannons in each corner. After a fierce battle, known as the Battle of Coleto Creek the Mexicans lost about 100 to 200 killed and wounded; Texian losses were seven to nine killed and 60 wounded. But, facing a Mexican Army three times as large, Fannin and his troops surrendered the next day. Fannin negotiated a surrender that would allow the troops in his command to be paroled. However, on March 27, all of the prisoners were marched to Goliad, where on Santa Anna’s order, the entire command was massacred. A few weeks later, when Houston finally engaged Mexican forces at the Battle of San Jacinto, cries of “Remember the Alamo! Remember Goliad!” spurred his men into battle. Victory and Texas independence followed, a legacy of Fannin’s sacrifice.